Creating a cool guest welcoming area doesn't have to cost a fortune! Brands like Mayline, Offices To Go, and Cherryman are ending the year with a bang by offering some of their hottest reception desks on sale with free shipping. Today we'll take a look at 5 of our favorites. Prepare to be impressed! 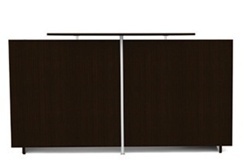 First up, the BT28 Brighton reception desk from Mayline with mocha finish. This dark laminate station is up to date with the hottest trends and shows minimal wear. The BT28 includes a suspended file pedestal for document organizing. 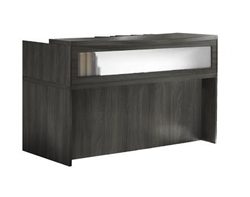 The 72" wide front desk and 48" wide return combine to provide your receptionist with ample operating space for just $913.99. We've highlighted the SL-O model Offices To Go reception desk before and we're going to again! Why? Because it's an absolute bargain buy that will help you maximize your corporate budget. This popular L shaped station includes a file pedestal and can be paired with hundreds of matching components from the Superior Laminate Collection to create an exceptional welcoming experience. The SL-O comes in well below our December Deals budget at just $620.99. Going for a cool modern look? 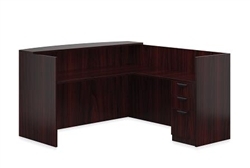 You can't go wrong with the VL-816 Cherryman reception desk from the Verde collection. With it's contemporary white transaction counter and accenting trim, this stylish station is unlike anything on the market. 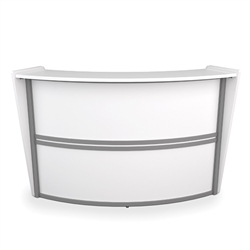 Budgeting businesses will love the unrivaled appeal and unique curves this reception desk is ready, willing, and able to provide for just $831.00. When it comes to finding a discount guest reception desk OFM has you covered. The stations from their Marque collection have become the preferred choice of industry specialists and interior design teams looking to maximize appeal without spending a small fortune. Marque stations like the 55290 are available in designer finish options, including white. 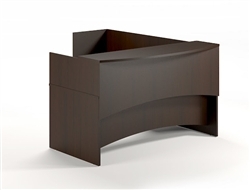 This curved front desk is more affordable than ever this month at $993.99. We've saved our favorite December reception desk deal for last! This rectangular station with translucent transaction screen is sure to earn your space the compliments it deserves for just $661.99. This gray reception desk from the Aberdeen collection is a breath of fresh air in a world filled with overly used cherry and maple tones. This station will help your business create a cool coastal vibe with a hint of modern flair. If you're looking for something different, cool, and effective that doesn't lack in terms of quality. Give this reception desk from Mayline your full attention.